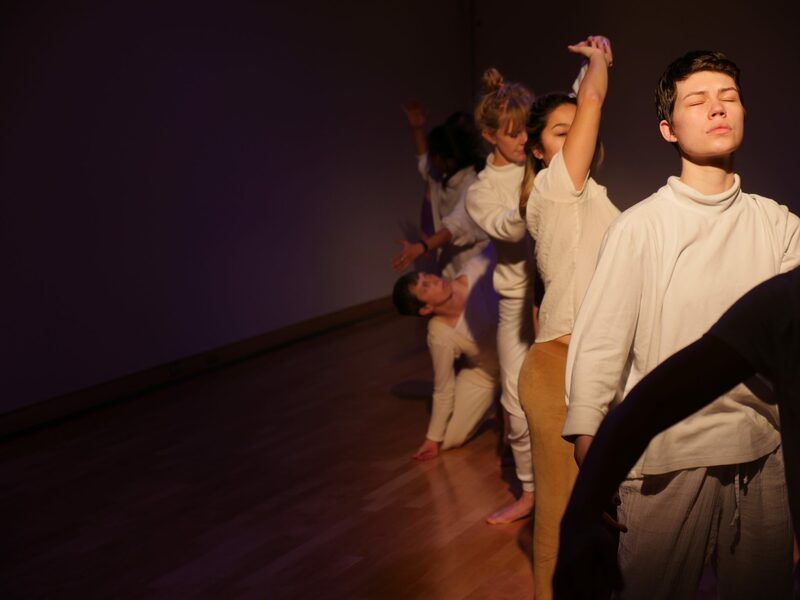 BodyCartography Project launched its monthlong residency at the Weisman Art Museum on Wednesday with a performance installation called “Felt Room,” a sensory experience on overdrive. Created by BCP’s co-artistic director Olive Bieringa, “Felt Room” is a dance show you don’t always watch with your eyes. Instead, the three-hour event is meant to be heard, smelled and touched (viewers can come and go as they please). The work has a cyclical nature, demonstrating birth and death, day and night, and the push-pull between needing connection and following individual impulses. Guided by Justin Jones’ gurgling soundscape of natural and biological noises, the performers inhabit intriguing qualities both as individuals and as a group, such as when they become an amoeba-like blob, moving together like liquid. Whether they are moving as one or separated throughout the space, the dancers’ connection to each other is remarkable to watch, speaking to the human need for relationship and community. The piece benefits from having top-notch improvisers in the cast, including Arwen Wilder and Anna Marie Shogren. The five women performers have moments of playfulness that are quite fun to watch. There’s an unspoken invitation for the audience to participate. That might mean walking to a different spot or encountering performers who physically interact with their visitors at times. Experiencing this work requires a certain amount of trust in the folks presenting it. Set in a square gallery space, there’s an intimacy and closeness between the audience and the performers. There’s a sense that the piece becomes individualized. Especially in the darkness, it becomes a show just for you. The work premiered in January 2017 at Perlman Teaching Museum at Carleton College, with a second showing that spring at the White Page Gallery in Minneapolis. A lot has happened between then and now, including the #metoo movement and national dialogues about consent. The physical touching that audience members experience during “Felt Room” — both from the performers and also, quite possibly, from other audience members moving around in the dark — feels dicey in light of the consent conversation. “Felt Room” continues through this weekend, with BCP’s “Action Movie” and “Lineage” performing the next four Wednesdays, plus additional artist talks and events.